Lethal League’s design oozes spectatability. Yes, I am aware that spectatability is not a word. But the game, more so than any other game I’ve played, seems to be designed with an audience in mind. Similar to games like Divekick, Samurai Gunn, and Towerfall, Lethal League falls into an emerging genre I like to call the “one-hit fighter.” As the name implies, these are fighting games where one hit means the end of a round. 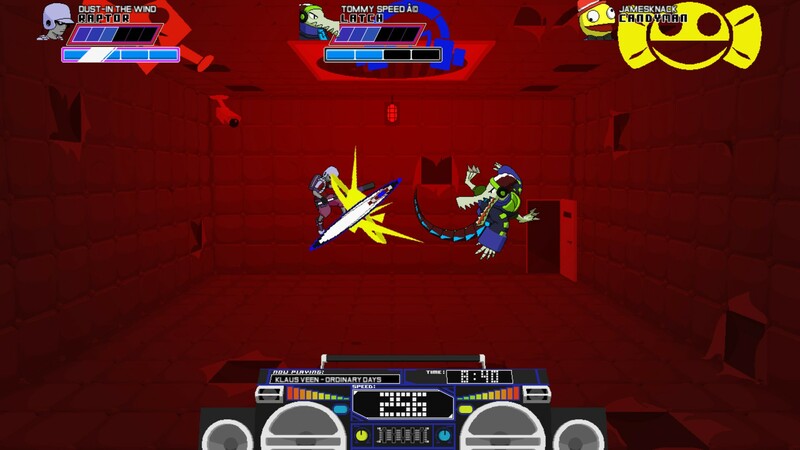 Lethal League, as described by its developer Reptile Games, “is a competitive projectile fighting game.” But unlike many of its fighting game brethren, Lethal League can be watched and, more importantly, enjoyed by people who are not experienced with the game. What gives Lethal League its allure is its simplicity, both in its gameplay and in its viewing. From the moment a match starts, everyone is focused on one thing: the glowing ball, floating center stage. The objective of the game? Hit that ball. Hit it fast and hit it hard. To get an idea of what I mean, here is a brief video of me playing against the computer. The game is, put simply, explosive. When getting hit means losing a round, there is never a dull viewing moment, especially when the ball reaches blindingly fast speeds. Tension runs high when you see someone slam the ball downwards and it stops, being held there for a few good seconds, building to a new, insane speed, before being let go to wreak havoc. The crowd has a chance to collectively hold its breath together with the players. The combination of high speed and nearly paused gameplay makes Lethal League incredible to watch. And I have no doubt that it was designed this was very intentionally. With the explosion of game spectatorship, many designers, particularly those designing fighting games and MOBAs, are beginning to think about how much fun their game is to watch as well as to play. This is not something that happened overnight or after Amazon acquired Twitch. When the 2012 League of Legends Season 2 World Championship broke 1.1 million concurrent online viewers, everyone took notice. A year later, the issue of spectatability was a key question during the memorable New York eSports Summit.